SQL – WAZIRay – my life. 1) Web Application already exist and you want to change the Content DB. 2) Web application should be created with existing Content DB. It’s better to stop the application pool for this web application from IIS. Delete the Content DB (if you don’t need it). The above command will attach the content Database and now execute the below PS command in same window. This command will upgrade the DB to the final version of your SharePoint Farm. This is very simple. Just mention the name of existing content DB while creating the new Web Application in the Central Admin. Optionally if desired you can execute the above command to upgrade it. or open the version table directly (Not recommended). The below links could help you to find what is latest version released by Microsoft. Recently we get stuck with an issue in Our Production SQL Server instance while moving the cluster instance to another node. Experienced DBAs knows that SQL Sever has it’s own Logs folder however there are multiple ways to find this folder, some of them are described here. Upon reviewing several error logs, we came to know that while adding multiple Data files for TempDB to improve performance , the DBA has mistakenly duplicated the logical file name and same name was assigned to two different physical files for TempDB. Below are some findings from logs. 2015-03-24 16:20:23.21 spid9s Starting up database ‘tempdb’. 2015-03-24 16:20:23.47 spid9s Error: 1828, Severity: 16, State: 1. 2015-03-24 16:20:23.47 spid9s The logical file name “tempdbDatafile3” is already in use. Choose a different name. 2015-03-24 16:20:23.48 spid9s SQL Trace was stopped due to server shutdown. Trace ID = ‘1’. This is an informational message only; no user action is required. 1) Inform all the clients to take their systems into maintenance mode which are connected with this SQL Server instance. 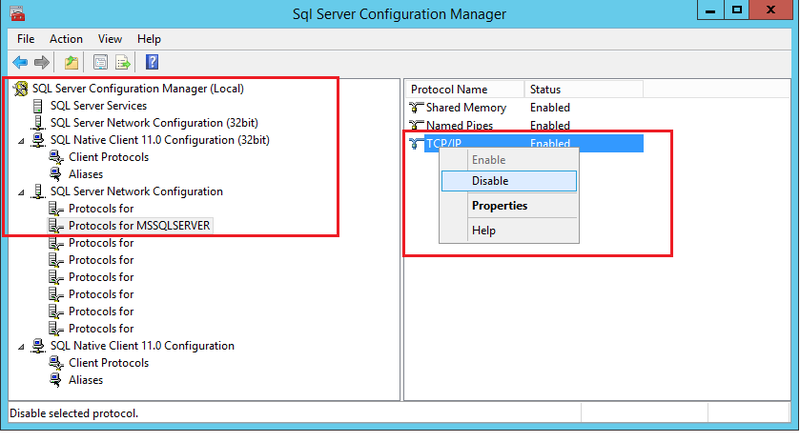 2) Open SQL Server Configuration Manager and disable the TCP/IP. This will help in running SQL Server in Single User Mode & avoid connections coming to this instance. Our Service was already failing to start. You may face the error below. here MSSQL11.MSSQLSERVER is name of your instance. Copy the value of “SQLBinRoot” which could be like : C:\Program Files\Microsoft SQL Server\MSSQL10_50.SQL2008\MSSQL\Binn (this path may varies due to version difference). 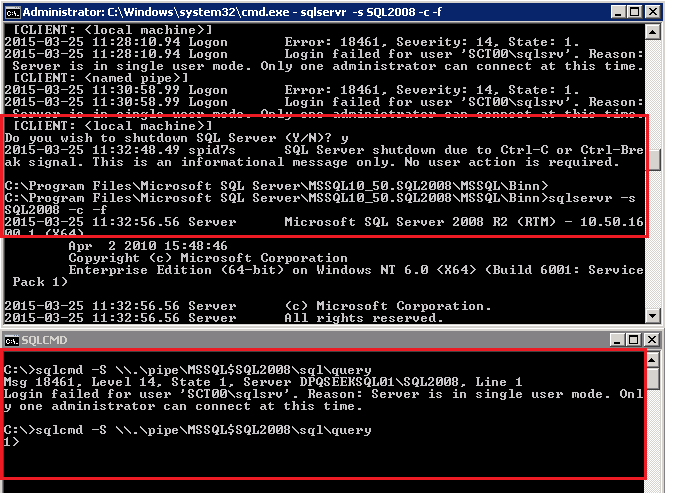 Copy this connection string (\\.\pipe\MSSQL$SQL2008\sql\query in above example). This will very according to version and named instance configuration. More about Named Pipes can be found here. If you face below error, try stopping sql server and restarting again in first window (simply Press Ctrl+ C and press Y to stop it). In second attempt we are able to connect. Now to find the files related to TempDB, execute the following command. To remove this file because we cannot rename in our case due to duplication run below command. Run select command again to verify if file is deleted. After verification stop/close all command windows, enable the TCP/IP pipes in SQL Server configuration manager and start SQL Instance Service. Read Move about Alter database file command.